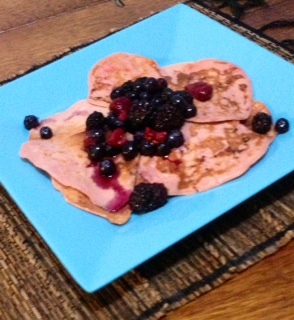 My favourite BodyScience protein powder is the summer berry flavour and I gave my ultra healthy personal trainer friend some to try too and she loved it so much she came up with a great recipe to go with it for pancakes and I thought I would share it with you. Combine the eggs and cottage cheese and mix well. Then add the powder and a dash of almond milk. Mix all the ingredient and cook on lightly sprayed or greased nonstick pan. Slightly warm some mixed berries and add on top of the pancakes and ENJOY! No syrup needed.